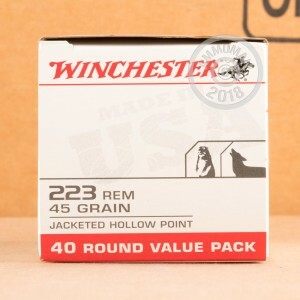 Make quick work of groundhogs, rabbits, coyotes, and other pest animals with this .223 Remington ammo from Winchester. 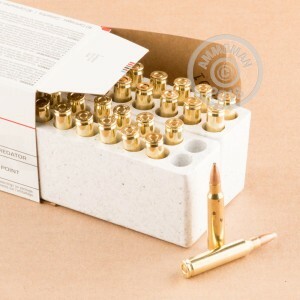 These cartridges can turn your AR-15 or other .223 Rem or 5.56 NATO rifle into a fearsome varmint gun thanks to their high velocity. 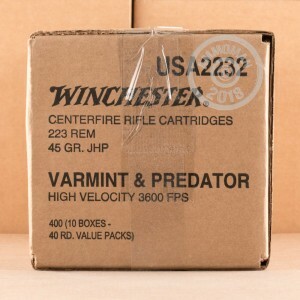 Each cartridge in this box of 40 fires a 45-grain jacketed hollow point (JHP) bullet at a muzzle velocity of 3,600 feet per second. This combination of a light bullet fired at a high velocity promotes rapid fragmentation for a clean kill against most small to midsize animals. JHPs are better suited to varmint and predator extermination as they will produce significant meat loss in game animals. Winchester ammo is loaded in Oxford, Mississippi using non-corrosive Boxer primers and reloadable brass cases. If you've got a serious pest problem, consider placing a larger order for $99 or more at AmmoMan.com--you'll get free shipping direct to your doorstep!